Vacation rental villa. Sleeps 10, 3 bedrooms, 3.5 bathrooms. No pets allowed. Welcome to our home, Desert Escape. Our 1812 square foot luxury villa includes 3 bedrooms, 3.5 bathrooms and has a maximum occupancy of 10 people. Dine outside while you enjoy the beautiful St. George weather. The Back View highlights the back of our beautiful home and emphasizes the spacious cement patio and outside dining table. This area is designed as an open floor plan and is a great gathering place for meals, games, or watching TV during your stay. The Kitchen Island comfortably seats 3 adults and creates a great space for serving and preparing meals. The Family Room, located upstairs, is a perfect place to relax or a great hangout place for children. This large sofa located in the family room can turn into 2 Queen beds. This Master bedroom has all the elements needed to relax after a long day. With a large walk-in shower, this is a perfect way to relax and unwind. Bedroom 2 includes a King bed, private TV, and walk-in closet. Bedroom 2 includes a Queen bed, private TV, and walk-in closet. 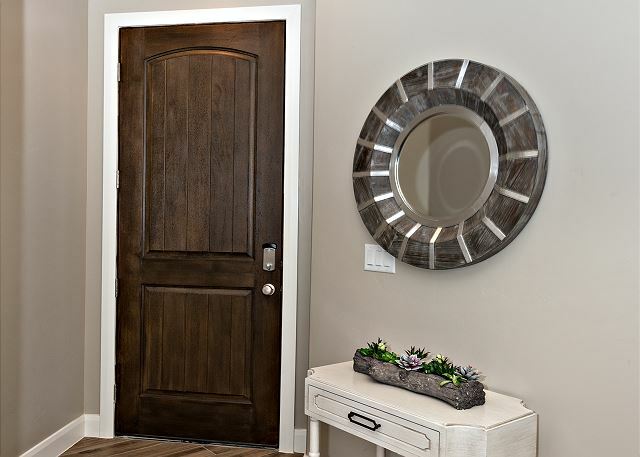 The Front Entry welcomes you to our home, Desert Escape! 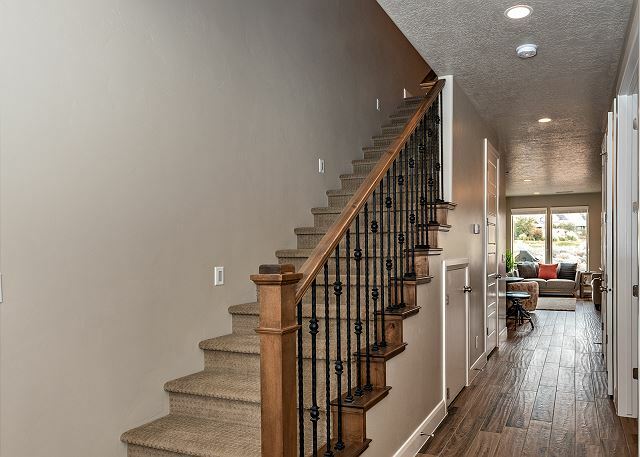 Desert Escape is a beautiful 1,812 sq foot home with 3 bedrooms. This luxury villa is furnished with all the upgrades you could ask for, including flat-screen HDTV's, granite counter-tops, as well as stainless steel appliances. The floor-plan is spacious with bedrooms that are quiet and private. Whether you're looking to relax or spend your day enjoying the surrounding landscapes, you can rest comfortably in the contemporary style bedrooms, partially covered outdoor patio, or spend time with family and friends in one of the two family/recreation rooms. Sleeps up to 12 people! TK, Thank you for choosing to stay with us at The Ledges. We appreciate you taking the time to give us such a great review and are happy to hear you were able to relax. We look forward to helping you again in the future. Thank you, from all of us at The Ledges. Very nice condo with awesome views and peaceful surroundings. Pool is great as well. Kelly, We appreciate you taking the time to give us such a great review. We are happy to hear that you loved the home and the amenities we have to offer. We look forward to helping you again in the future. Thank you, from all of us at The Ledges. Very nice place, great location. Really enjoyed everything. Delaney, Thank you for choosing to stay with us at The Ledges. We appreciate you taking the time to give us such a great review and are happy to hear that you loved the home. We look forward to helping you again in the future. Thank you, from all of us at The Ledges. Such a beautiful view and very comfortable condo. Beds are super comfortable and living room space is very functional and all the necessities are available. Loft is amazing for the kids and sectional is suoer inviting. Kelly, Thank you for choosing to stay with us at The Ledges. We appreciate you taking the time to give us such a great review and are happy to hear that you loved the home. We look forward to helping you again in the future. Thank you, from all of us at The Ledges.